During February/March 2014, I headed to New Zealand for a rather long trip in this mythical country. Many things to tell about this stay and I shall start with a post about the most emblematic animal from New Zealand, I mean The Kiwi. Despite it was a mix of familial and nature trip, not only focused on birds, I traveled from North to South during 2 full months, with always in mind the search for Kiwi. But it proved to be very tricky. Even if it is a rare species, there would be at least 50.000 Kiwis spread over New Zealand. 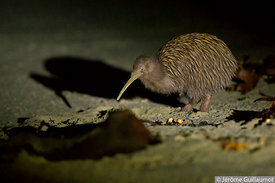 But what makes it very difficult to spot is that the Kiwi is almost entirely nocturnal and lives in forest areas. Being an endemic species, added to the fact that its habitat is quickly shrinking due to the massive deforestation of the country, put them on the IUCN Red list, classified as “Near Threatened”, for the Little Spotted Kiwi, and “Vulnerable”, for the Stewart Island Brown Kiwi. My first spotting of the species was a captive Kiwi in Rotorua (a geological site from Northern Island famous for its geysers.). Nothing to be very proud of but nevertheless an interesting opportunity to see the bird for the first time and observe its curious silhouette. The best chance to spot a Kiwi in the wild is by visiting one of the few sanctuaries built in New Zealand in order to save the last endemic bird species of the country. These sanctuaries are large and properly fenced areas over thousands of hectares (or entire oversea islands) from which the introduced predatory species (Cat, Dog, Fox, Opossum, rats,…) have been eradicated to give a chance to the endemic species to thrive far from those invasive and aggressive animals that Evolution didn’t prepare them to compete with. But, even in this case, the first thing that you hear when you prepare to visit one of these sites, famous for Kiwi presence, is that “you will certainly not spot any”. Very discouraging…but unfortunately it proved to be true in 3 out of the 4 sanctuaries I came to visit. Anyway, according to guide-books or internet resources, the very best chances to spot the mythical bird is to go to Stewart Island. Stewart Island is a small island south of South Island and this is really the place to go for a bird lover. The village of Oban is the only inhabited place of this very wild Island. And half of the New Zealand Kiwis populations are located on Stewart Island (that means 20 to 30.000 Kiwis)… Close to Oban, Ulva Island is a sanctuary for many of the endemic birds of New Zealand. There, I spotted a Weka catching a red-fronted Parakeet ! Incredible scene… So, I spent 4 days in Stewart Island and, to be sure to spot the bird (Stewart Island Brown Kiwi – Apteryx australis lawryi), the very first evening I joined a guided tour. We boarded on the Wildfire for a 1,5 hour cruise before joining a remote beach. During the cruise we saw Buller’s Albatrosses and Little Penguins. Once on site, we had a half of an hour walk before we reached the Kiwi beach. There, we spotted successively 4 Kiwis foraging with their long bill in the sand in search for food (small insects and crustaceans). A rather good spotting of pretty active birds during a good 15 minutes despite the group size (about 15 persons) thanks to a smooth approach and a relatively long sighting distance. Here again the light conditions were poor and not sufficient for good photos (Photos #2, #3 et #4 ). After this sighting, the essential was done : species spotted and photos taken. Afterward, I spent 4 days looking for a more personal encounter across Stewart Island. The species is sometimes said to be rather easy to see at Stewart Island, even by daylight, but it is not at all. Despite the numerous hours walking in the wild : no Kiwi to be seen. Nonetheless, I knew that they were around and very close… From my first night on the Island, I could hear their noisy calls throughout the night right from my B&B. I tried a night hide at a place that was recommended by the guesthouse owner. The site is an open plain at the edge of a remaining primary forest. The night was dark and I was walking with the moonlight and from time to time I used my mini torchlight to find my way. As soon as I reached the targeted area, I spotted a round shape, 30 meters far from the forest edge in the open. Impossible to believe that it could be the coveted Bird. Too easy ! I focused my torch to check. Houla ! I can not believe what I can see : It is truly a Kiwi ! After 2 months and so many hikes and hides expecting this encounter, here it is : only 400 meters from my guesthouse ! 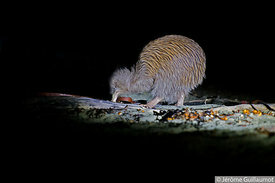 But, certainly worried by my torch, despite it is really a dim a distant light, the Kiwi moved on. A brief spotting ? Not at all ! Instead of fleeing away, my Kiwi was running toward me. 20 meters : I don’t even breathe. 10 meters : I must be dreaming. 5 meters : must I try a photo ? I am holding all my gear (15 kg) but I am petrified. I don’t try a move fearing to break the spell. 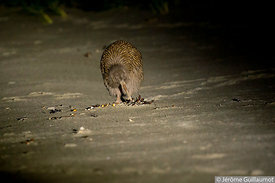 Anyway, by night, only a photo with flash could work and it would end with the Kiwi fleeing away. 1 meter : it is incredible ! This is a good sighting indeed ! But it soon turned into a metaphysical experience when the Kiwi came still closer to me and then…bit 2 or 3 times the lower part of my trousers with its beak ! Then the bird eventually left me and walked to the forest. This made my day, my week and my trip ! No photo but a very strange and ecstatic moment. And I became one of the few people in the world who had his pants bitten by wild Kiwi ! This was one of these great and unforgettable wild encounters that make you sweat, hike, long wait and travel far and reward you in an unexpected way.